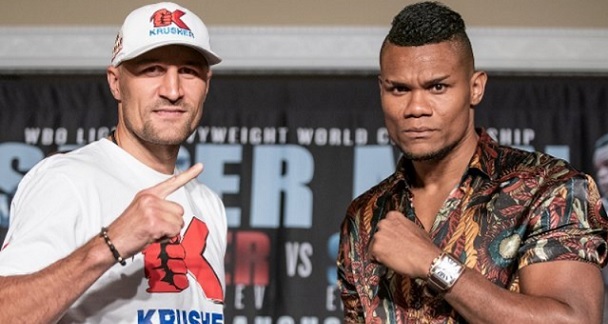 Sergey Kovalev and Eleider Alvarez will fight on Saturday night / Sunday morning in Atlantic City for the WBO LightHeavyweight Boxing World Championship, currently held by Kovalev. Sergey Kovalev (32-2-1, 28 KO) suffered the only two losses of his career back in 2016 and 2017 against the exceptional Andre Ward. Those were two highly competitive fights and Kovalev was actually robbed in the first one, which he should have won. The Krusher exited both fights with his head held high despite the losses, and he proved he hasn`t lost a step in his next two fights – defeating Shabranskyy and Mikhalkin (this year in March) via convincing KO victories. Eleider Alvarez (23-0-0, 11 KO) still has an unblemished record to his name, but Kovalev will be by far the strongest opponent he has ever met. An honest fighter, Alvarez won his first 21 bouts against rather weak opposition before claiming two big names in his next two. Alvarez defeated Bute via a 5th round KO (with Bute being the better fighter until that point) and Pascal via a majority decision. However, both Bute and Pascal were washed up and way past their best. Both fights were in the first part of 2017 and Alvarez has not fought since then. Bet on Kovalev vs Alvarez and claim your 100% (100 Eur) free bet at Ohmbet now! Kovalev is 35 y/o, stands at 1.83 m tall with a reach of 184 cm. Alvarez is 34 y/o, stands at 1.83 m tall with a reach of 192 cm. Despite his two losses against Andre Ward a couple of years ago, Kovalev remains one of the best P4P fighters in the world. Losing to the undefeated Ward was no shame, as the American is probably one of the best and most underrated fighters in modern history, arguably right at Mayweather`s level. What`s more, both fights were epic, close and controversial. Kovalev actually won the first one, but was robbed, and in the second one Ward used a few low blows to stop him (although Ward would have probably won it anyway). The Krusher is now on a journey to prove he is still one of the world`s best, and has been at a very high level in his last two fights. He got the WBO championship back, and now he must defend it against Alvarez. Alvarez is an honest, solid fighter, but really has nothing special. He has a good boxing IQ and a good chin, but no special weapons and no real punching power. He is a good title challenger, but does not have the quality to be a champion barring some favorable circumstances. The 23-0-0 record of Alvarez is definitely misleading, as he mostly met poor opposition during his career, and even the two good fighters he met (Bute and Pascal) were old and nowhere near their best. Also, Alvarez didn`t exactly show a lot in those fights. He KO’d Bute after 5 rounds but he was losing that fight up until that point. He got a majority decision against Pascal, keeping him at bay with his jab in a rather bland fight. Alvarez was good (not great), pragmatic and opportunistic, but not impressive – and that`s just the kind of fighter he is. Kovalev is a completely different beast and Alvarez hasn`t met anyone remotely close in quality to the Krusher. For example, Kovalev dismantled Pascal twice (once via KO and once via retirement) and that was during Pascal’s prime. Alvarez will try to slow the fight down and use his superior reach by jabbing away at Kovalev. However, that is highly unlikely to work when one is so utterly outmatched in both talent and power. Kovalev was barely outboxed by the mighty Andre Ward, he surely won`t be outboxed by Eleider Alvarez. The Krusher should be able to control the fight and get close, especially as he knows Alvarez doesn`t possess much KO power. And when Kovalev gets in, it will likely be lights out for Alvarez. 28 out of Kovalev’s 32 wins have been by a way of KO. The 4 wins which didn`t end with a KO were as follows: two were early in his career, one was against the legendary Bernard Hopkins in 2014 and one was against Isaac Chilemba in 2016, which was a preparation match before Kovalev`s first meeting with Ward, and he played it cool, not taking risks. Even if Alvarez is a good, determined and smart fighter, he just doesn`t have enough quality to be able to use those advantages against a monster like Kovalev. Alvarez might have enough to make this a fight early on, but once Kovalev starts to connect, the Russian should be on track to score another big KO victory. The chin of Alvarez is pretty reliable, but has not been tested at this level, and is likely to fail if Kovalev overwhelms Eleider. There`s also the fact that Alvarez hasn`t fought in over a year, and now he`ll suddenly have to face one of the biggest punchers in boxing, who fought regularly lately. Another thing worth noting is that Alvarez fought only twice before outside of Canada, and only once in the US – both times earlier in his career in small fights. My tip here will be the Krusher to win via KO, TKO, retirement or disqualification. Odds are dropping on this bet, and that`s no surprise. Alvarez deserves respect, but the bookies seem to be giving him a bit too much. I would have priced Kovalev around 1.10 to win and 1.5 – 1.6 for the KO. Prediction: Kovalev by KO in Round 7.